Download ppt "10 Aug 2010PC 423 1 Analysis PC Schedule Tuesdays fortnightly Provisional dates 10 Aug 24 Aug 7 Sept 21 Sept But it’s holiday season so they may vary –"
K. Long, 18 April, 2015 Beam-line status — red sky at night? 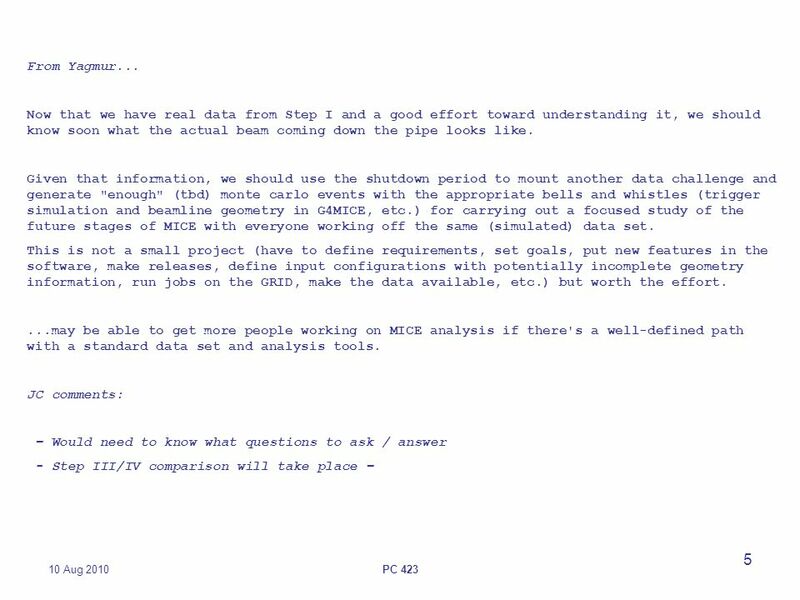 Software Summary Database Data Flow G4MICE Status & Plans Detector Reconstruction 1M.Ellis - CM24 - 3rd June 2009. 1 Approaching the Problem of Statistics David Forrest University of Glasgow CM23 HIT, Harbin January 14th. 1 26 Nov 2010 SOLID ABSORBERS Solid absorbers will provide first cooling demonstration –This is important for a number of reasons! Can use only solids. 1 MICE PM Report General Update –Phase I civil engineering –R5.2 in June –Phase II design work –Phase II hardware –A few questions –Schedule, milestones. Linda R. Coney – 24th April 2009 MOM Update Linda R. Coney 21 September, 2009. Data Quality Assurance Linda R. Coney UCR CM26 Mar 25, 2010. 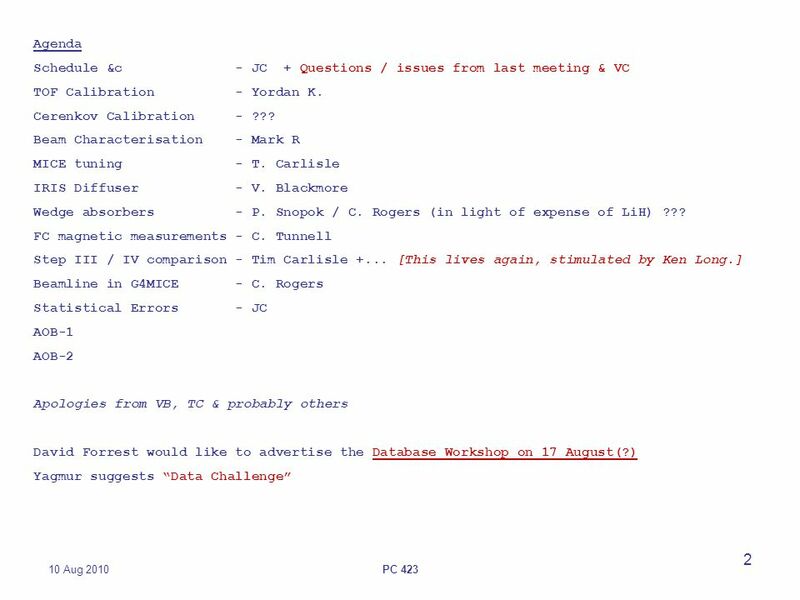 1Malcolm Ellis - Video Conference - 7th December 2006 Data Challenge Report  Disclaimer  Data Challenge definition(s)  Software status u G4MICE u GRID. 1 PID Detectors & Emittance Resolution Chris Rogers Rutherford Appleton Laboratory MICE CM17. Linda R. Coney – 24th April 2009 Online Reconstruction & a little about Online Monitoring Linda R. Coney 18 August, 2009. 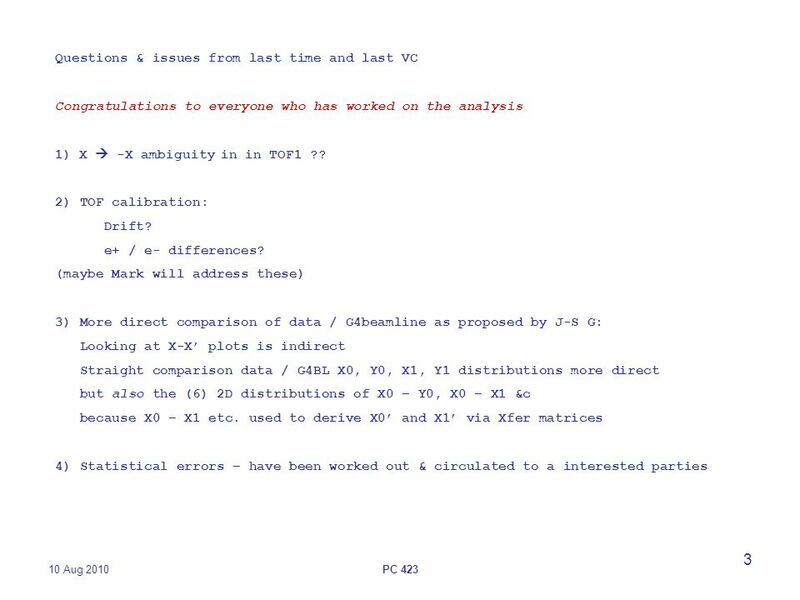 Beam line characterization with the TOFs1 Demonstrating the emittance-momentum matrix Mark Rayner, CM26 California, 24 March Initial. Diffuser in G4MICE Victoria Blackmore 09/03/10 Analysis Meeting 1/8. MICO 9th Aug 2010J.S. GraulichSlide 1 MOM report o Last Week o Run Plan for this Week o Machine Physics Jean-Sebastien Graulich, Geneva. 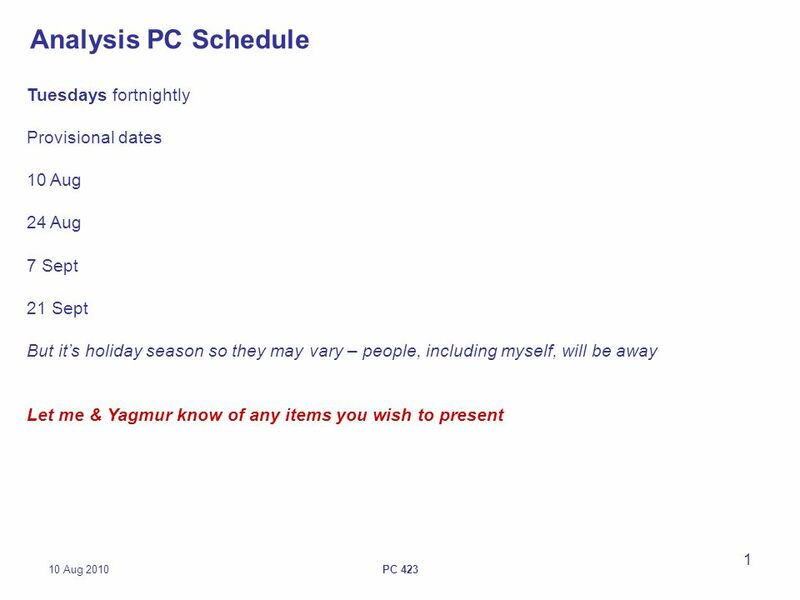 24 Nov 2009PC Analysis PC Schedule 2009 Tuesdays fortnightly Proposed dates: 13 October  27 October  CM25 4 – 6 November  24 November 8 December. 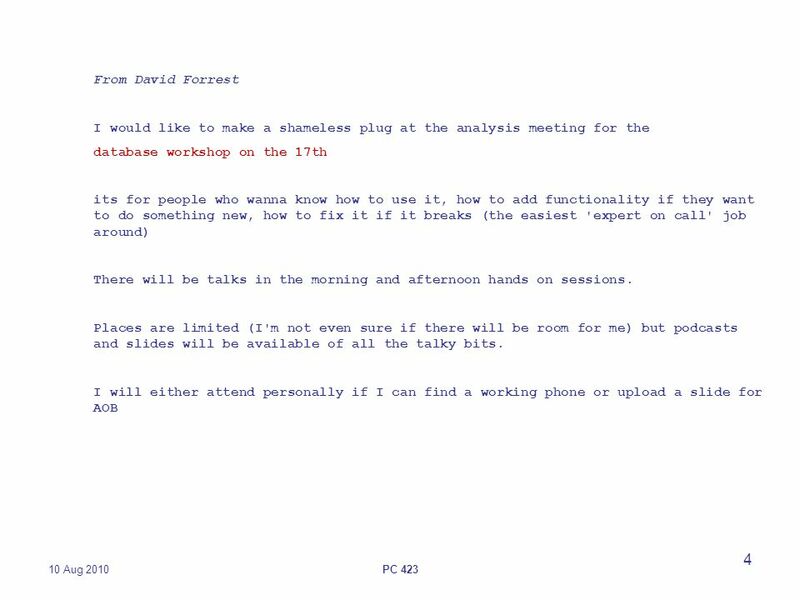 Software Parallel Intro 1M.Ellis - CM23 - Harbin - 15th January 2009  Focus this CM continues to be on needs for analysis of data and use of G4MICE online. MICE analysis meeting Alain Blondel 5 August MICE -- what running strategy? disclaimer: of course we will evolve the running strategy as problems. 1 Statistics David Forrest University of Glasgow. 1 G4MICE TOF Reconstruction & KEK Test Beam Analysis Update Aron Fish Tracker Phone Conference May 25, 2006. A NALYSIS OVERVIEW & “T HE M ISSING P HYSICS ” V. Blackmore CM38 23rd February 2014 1/14.